I recently purchased a Yamaha CSGIII Bb clarinet and love the keywork, craftsmanship, tone etc. I've heard that they also have some of the best intonation tendencies out of all professional level clarinets however, since playing for about a month now, I am beginning to notice some of the intonation tendencies. In particular, throat E and F are very flat (sometimes 15-20 cents lower than the rest of the throat notes). Can someone please advise whether this is a problem that can be remedied with a change in mouthpiece/setup? I'm currently playing on an older B40 mouthpiece after finding that my M30 Series 13 is far too low in pitch even when warmed up. Any suggestions to fix this unusually low E and F would be greatly appreciated as I love everything else about the clarinet! The solution will have to take into account the notes around E and F plus the notes for those fingerings in the upper register. A barrel change may be helpful. It is not unusual to have to undercut the tone holes responsible for those notes. I have played the original CSG for 11 years now and this tendency was present even in the original design. On the other hand, the 12ths are not too large so that the clarion B6/C6 are not overly sharp as on some instruments. Usually, this is not a significant problem, but on occaision I have found it helpful to use the LH C# or RH D# trill key to raise the pitch of the throat E/F. Knowing that these notes are low, I will voice them with more intensity (i.e., the "eee" voicing) as well to ensure adequate breath support. Although one could use a shorter barrel to fix THESE notes, it can make the OTHERS too high, so in general I've stayed with 56.5 mm barrels and just corrected the pitch on the E/F when necessary. I have also found that the Backun CSG Fatboy barrels work very well with the CSG--they tune well and do focus the sound more as well as making it "smoother" (Sorry, this perception is hard to describe). While the M30 (as well as the BD5-13) do tune low, they could be used with a 54-55.5 mm barrel to compensate. I've been playing the (A442) Kessler-Backun-III mouthpiece for several years now and it has worked really well for me. Currently, I'm also trying a Backun P+ which works very well though it has more resistance. It also has great intonation and a great sound. When using Pilgerstorfer Dolce or Leuthner French reeds, I can get as close to a German (or even Viennese) sound as I've ever been able to when this is called for. Finally, if you DO think a modification is warranted, I would recommend going to one of the Yamaha Atelliers (Buena Park CA or New York or ...?) to have this done. I'm near the one in Buena Park and they have an amazing machine shop and can do almost anything, including building prototypes from scratch! I hope you will enjoy your CSG for years to come! This can be fixed by undercutting the related tone holes which will raise the pitch of the E and F without raising the pitch of the upper B and C. This could have been done in the factory, but apparently was not. Perhaps you can take it to a clarinet tuner for this work. I know this is obvious, but have you checked pad height of the left hand pad/ring key? As mentioned above - opening the c#/g# key sharpens e and to a lesser extent f... I've known at least ONE fine player who actually included this in her scale routine. If the throat e is still flat with only the c#/g#-key added, or sharp with the d#/a#-key, you may try also this one: X0Xc#+d#|000 It's complicated, but I use it routinely on my Wurlitzers, up to 1/8-note speed. When faster, I use only the d#/a#-key, though it's somewhat sharp. On my CSGII, the throat E is also a little flat (about 5 cent). Before deciding on this clarinet (to replace my old Buffet), I also tested another CSGII and (Yamaha) CSVR and found them with the same tendency so I figured this was probably a common tuning issue. Seems to be a common problem with these clarinets. When they (original CSG's) first came out, I tried six and they all had this issue. I contacted Yamaha and they sent me a clarinet that was a CSG prototype and also a bunch of barrels. Still had to use the C# key to raise the pitch. Now I have a CSG III and it has the same problem. But it's no bigger deal to add that extra key than it is to use resonance fingerings on the throat tones. I also experienced this on my CSG’s, but the issue resolved with time. You have to be open to learning how this instrument steers, especially if you are approaching the CSG from the Buffet R13. I really think one out of tune is better than alot of very slightly out of tune notes..so really venting it is not a problem..also some mouthpieces even among the same facings will play somewhat better overall so give it a shot. How are the B and C 12th above (same fingerings with register key)? Both B and C are pretty in tune on my CSGII. I imagine the same for CSGIII. As far as I know, the obvious changes on CSGIII from I/II are tone holes for D/A and C#/G#, slightly thicker barrels and bell. CSGII added metal tenon caps (removed on III) and low E/F pitch correction mechanism (based on original CSG). 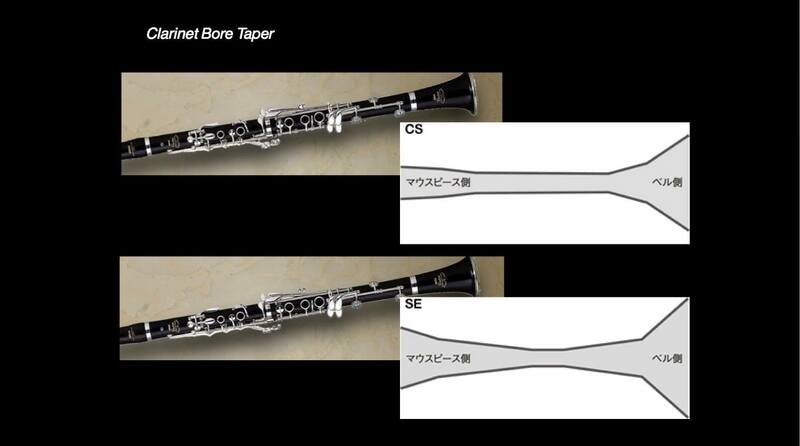 The CS bore family from Yamaha includes CSV(R), CSG, 450 so they should have similar playing characteristics with different customization. I just worked with Wolfgang Lohff about the same issue on my CSG II; only the E, the F is fine. As the B a twelfth above was also a few cents flat, he undercut the appropriate tone hole. We went through a few iterations and now the high B is right in line, and the E, while still a bit flat, is considerably closer. The CSG has a single uniform bore. The CSVR has a polycylindrical bore. That’s one of the primary reasons their playing characteristics are so radically different. Glad to know you play CSG too. Like I said I prefer it to CSVR when I was in the process to replace my buffet Festival. I agree with you they are different. I would appreciate if you can share where you got the information that CSG has single uniform bore (straight bore? ), as it is different to my understanding, which I got from Yamaha's brochure (pg 3 in the link below) for Japan market, where these models are named differently. Ideal-G (which has short barrel like CSG) was the predecessor of CSGIII, which just became available in late 2017 in Japan to replace Ideal-G. Also, because of their names, I think CS-V, CS-VR, and CS-G belong to the CS side of the bore family, which definitely has less tapered bore, compared the SE family but it is still not straight and to me it is still poly-cylindrical. I think the felt differences could be different undercutting and customization for each model. I mentioned the bore family in my previous post since I felt throat E of the CSVR I tried was a bit flat as well. Looking through your literature and the literature that I can find easily -- I have no information to back up my statement. Having said that, I have seen (within the past several months) a Yamaha graphic that described the CSG bore as straight, the CSVR as shown in your literature, and the SEV as an "hourglass". I'm trying to find that image. Do you think that the large difference in playing characteristics between the CSG and CSVR are only attributed to the different upper joint & barrel lengths? The CSVR has a (roughly) 66mm barrel and the CSG (roughly) 54mm barrel. I think it more likely that Yamaha isn't explaining the difference. That will be great if you can locate the said graphics showing these bores. that is a very correct diagram this shows very clear the csg is a straight small bore ..note the lower joint opens quite a bit later than the se which is more of an r13 design. with a little bit of work all of the notes on a straight bore can be tuned but with the right mouthpieces and reeds...not sure if the e on the 1st line is as low as the post espouses..this area of the clarinet requires a good embouchure..as the throat register is the hardest to tune..and after that of course the altissimo.